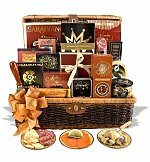 Unique-Gift-Baskets.net is a gift basket guide and provides high quality gift baskets and gifts for all occasions. Your satisfaction is our number one goal. You can contact us by calling 301-919-1849, or you can email us here. We will do our best to contact you within 8 hours during business hours. We are also available by chat, just click the "Live Help" button at the top right of each page. Our business hours are Monday thru Friday, 9am - 5pm. Saturday, 10am - 2pm. We accept all major credit cards and Paypal. You do not need a Paypal account to order. Orders paid through "bank payments" may require time to process. Your order will ship when the bank payment clears. To calculate the shipping cost of a gift, add it to your cart and enter the recipient's zip code. You can view your selections by clicking on the "View Cart" button. 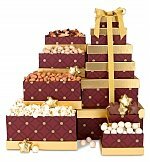 We ship our gift baskets and gifts by FedEx and UPS. We offer several shipping methods for your convenience, including ground, 3-day, 2nd day and overnight delivery. Alaska and Hawaii require a $10 charge in addition to the standard 2nd day air fee. Second day air is the only shipping method available for shipments to Alaska and Hawaii. We will contact the buyer prior to taking the additional $10 Alaska/Hawaii shipping fee. Gift baskets and gifts are shipped. We will need the name and street address of the gift recipient. Deliveries are not made to PO Boxes. 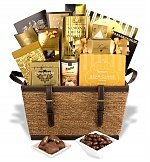 Gift baskets and gifts ordered today will be shipped on the next business day. Orders placed on Saturday will be shipped on Monday. Weekends and holidays are not considered business days. 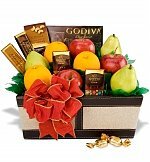 Multiple orders of gift baskets or gifts will generally not be bundled and will be shipped individually. If you have time considerations, make sure to order the proper shipping method. Standard Shipping: Standard shipping takes from 2-3 business days. 2nd Day Shipping: Second day shipping takes from 1-2 business days. Ground Shipments: Ground shipping takes from 2-7 business days. For FedEx Ground, a business day does not include Saturdays, Sundays, or holidays. Ground Shipment Example: You ship a package on Monday that takes 3 business days to arrive. You do not count the day you ship as a business day, so your package would arrive on Thursday, the third business day after the ship date. This example is for ground shipments only.